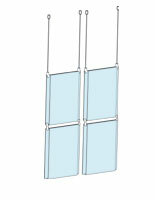 These window display kits are great marketing tools. 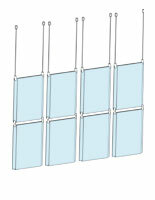 Advertise using several acrylic panels that suspend from the ceiling. 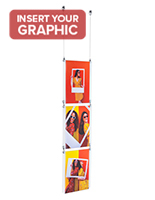 The window display kits, also known as a poster exhibits or cable hanging systems, allow great flexibility in advertising. 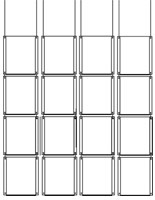 The matrix design lets you decide how many panels will be displayed at one time. 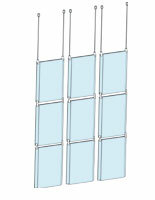 Why would you want a matrix style window display kit? The uses for these systems are virtually endless. 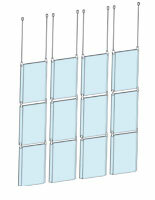 For example, these window display kits may have 16 acrylic panels. 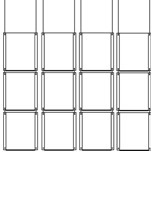 The panels are set up in rows and columns. 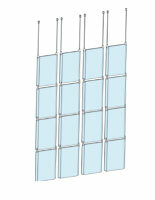 The window display kits allow you to create one huge mosaic image. 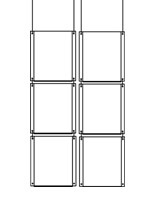 Or, you may exhibit geometric shapes to add dimension to a mannequin display. 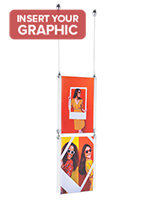 Present an entire spring line in one window with these effective advertising tools. 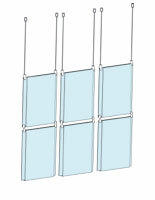 SignSupplies.com sells these window display kits in many configurations. Check out the many categories to see them all! 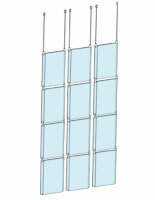 How can your business use a window display kit? 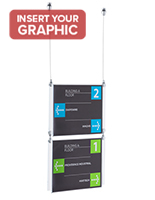 These hanging sign systems are perfect for the exhibit of any number of items. Salons showcase signature hairstyles and nail art. Tattoo parlors show off their artwork in matrix signs. Real estate agents advertise homes for sale. 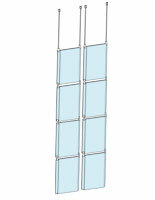 Architects present their drawings, and interior decorators present room designs. All used to show off their talents and wares to passersby. 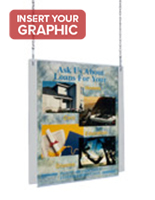 While most often used in advertising, the cable sign systems are also ideal for decorative displays. 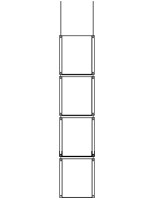 Poster images may be hung from the ceiling in an atrium, foyer, or waiting room to add both dimension and color to the room. An additional use is for information purposes. 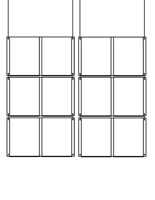 These poster holders allow for the exhibit of one sign on up to 16 signs. That makes them the perfect choice for information signs. 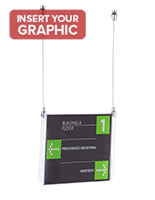 Post a hanging cable sign that directs customers to the rest room, food court, or any department in a store. 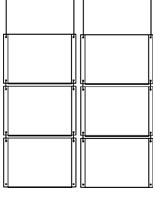 The best part is that the signs are two-sided so they may be placed at any point in a large room to provide the information needed where it is needed. 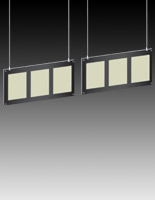 As they hang from the ceiling, they will be clearly seen by all. 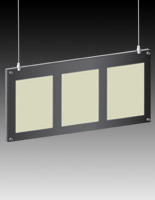 What is included in a ceiling hung sign kit? 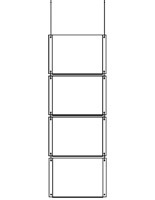 These systems are sold in a variety of configurations. 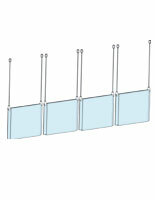 You may choose a ready to ship storefront sign kit as a single acrylic panel on up to 16 panels. 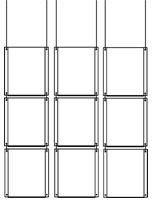 The poster displays may be set up in columns and rows, or they may be hung separately. 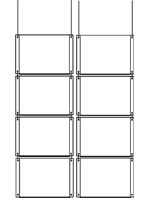 That way you don't continually have to exhibit the 16 panels, but can set up as many as you necessary to meet your immediate needs. 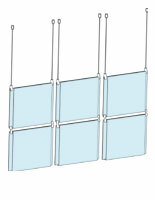 These sign supplies for hanging in windows are also sold with a portrait or landscape orientation. 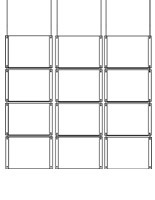 In addition to the panels, each order will include a specific number of 16' coils of nylon coated steel cable. 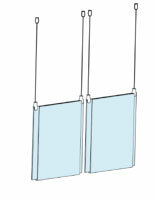 The steel cable is nylon coated to ensure it will not fray when cut to size. 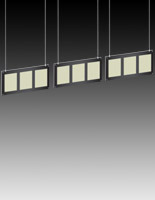 At 16', you are certain to have enough to hang your messages from the ceiling. 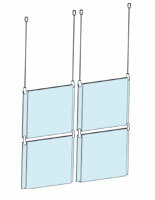 A single poster holder will include two coils, one for each side of the sign-frame. 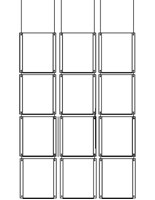 A 16 panel system will include eight coils so you are able to create four rows of four posters. 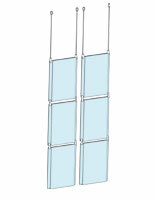 The final components of these systems are the connectors. 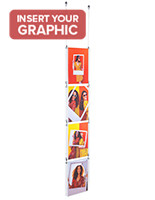 They come with enough ceiling mounts and panel connectors to create the montage of posters that will capture the attention of everyone. 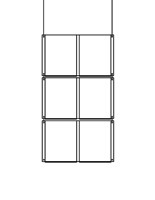 They even come with the Allen wrench to put all the pieces together! 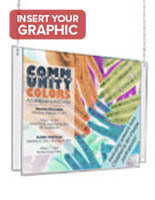 These acrylic poster systems are ideal for use in retail associations. Imagine your fall collection presented on mannequins with a mosaic of posters that show the many other items in that collection. Or, feature summer clothing with images of the sun and beach to create a fun window design that attracts the attention of shoppers. 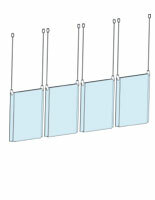 Other retail associations use cable hanging signs to post store hours, holiday signage, and information. 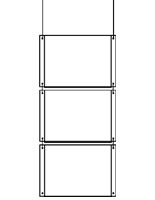 Strategically hang a clearance sign above your clearance aisle to attract attention to the rear of your store. As shoppers may their way back to see what's on sale, they will most definitely browse through your new arrivals and special collections. Or, attract attention to your new arrivals so that everyone will know that they've arrived! 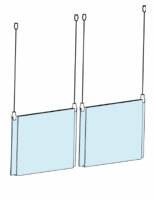 A cable suspended sign is the ideal choice for directing customers to the check out counter, restrooms, and fitting rooms. 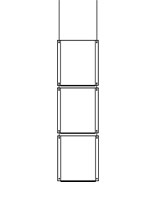 The suspended sign is great in professional offices, too. Direct clients to a conference room, client service office, meeting hall, or human resources department. Real estate agents appreciate the fact that they can present photos of listed homes to peak interest in those homes. The best part about using a window display for this purpose is that passersby are able to see what you have to offer both day and night – even when your business is closed! 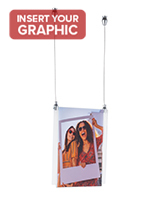 A suspended cable sign system is absolutely an attention grabber. 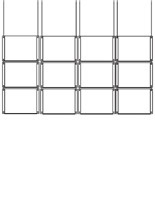 This category features signage that uses standard letter-sized inserts. 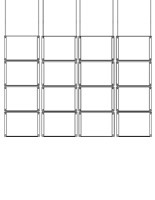 That's 8-1/2" x 11" documents that may be printed on your personal printer. Quite the cost save, isn't it? 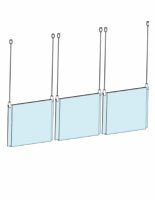 Other models include acrylic 11" x 17" sign holders and 18" x 24" holders. 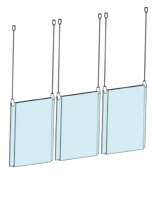 These systems use nylon coated stainless steel cable to suspend signage from the ceiling. 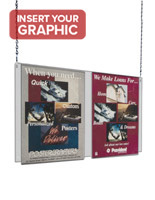 Other models that we offer in our sign supply catalog are models that attach to the wall or window or use chain instead of cable. 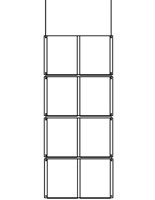 View the many styles from our home page now! 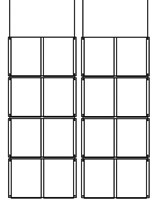 Buy sign supplies including ready to ship banner stands and sign frames in many sizes from the sign supply specialists today! 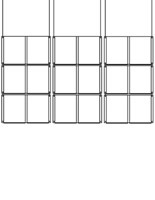 Our fully-stocked warehouses allow us to offer fast shipping on every product.